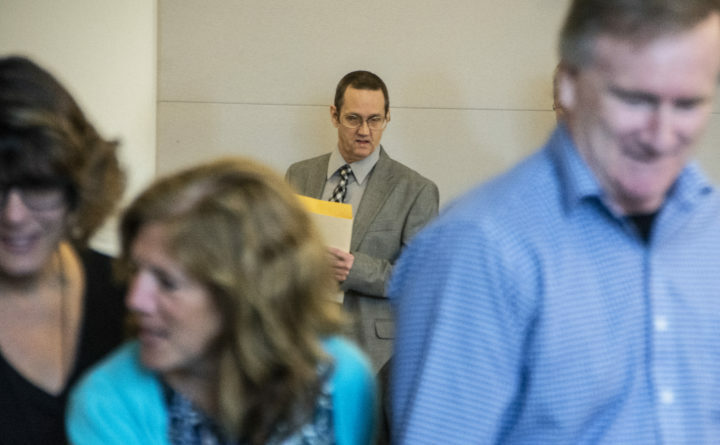 Convicted murderer Phillip Scott Fournier (background) prepares to sit at the defendant's table while Teresa Curley Beaudoin (left to right), Laura Shea-Merrill and David Collinsworth -- all best friends of murder victim Joyce McLain -- attend Fournier's sentencing on Friday, April 27, 2018. The friends detailed how the murder devastated their lives. Convicted murderer Phillip Scott Fournier (center) and his attorney Jeffrey Silverstein (far right) talk shortly before Fournier's sentencing begins in Bangor Judicial Center on Friday, April 27, 2018. 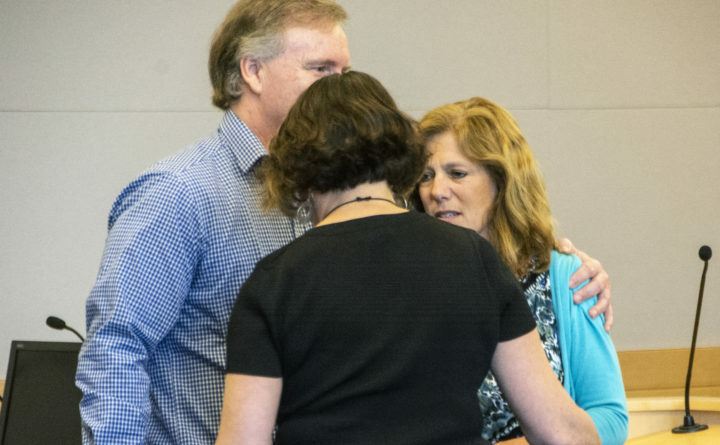 Laura Shea-Merrill and David Collinsworth comfort Teresa Curley Beaudoin after the women spoke at the sentencing of convicted murderer Phillip Scott Fournier on Friday, April 27, 2018. 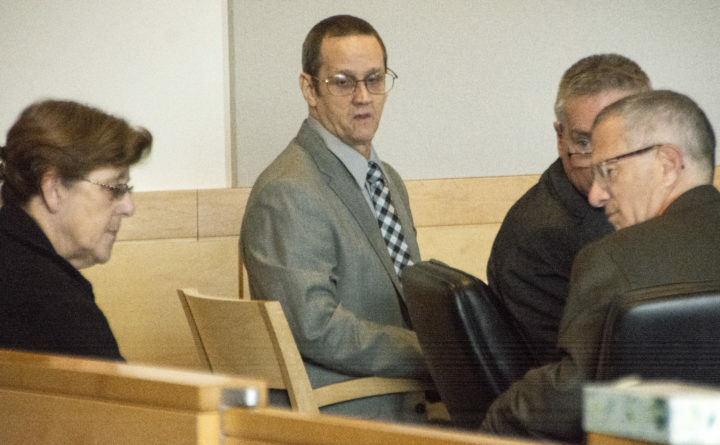 Philip Scott Fournier, the East Millinocket man convicted of killing 16-year-old Joyce McLain nearly 40 years ago, was sentenced Friday at the Penobscot Judicial Center in Bangor to 45 years in prison. “This was a cruel and violent act,” Superior Court Justice Ann Murray said after hearing emotional testimony from McLain’s family and friends. The victim’s mother, Pamela McLain of East Millinocket, was too ill to attend the sentencing, Assistant Attorney General Leane Zainea said. Victim witness advocate Renee Ordway read Pamela McLain’s statement in which the mother said she had spent nearly 40 years waiting for her daughter’s killer to be prosecuted. John DeRoche of Bangor testified that in 1989 while working as a janitor for Husson College, Fournier confessed to him that he’d killed Joyce McLain. Fournier also said he’d been interviewed many times by investigators but had never been charged. “Philip Scott Fournier not only murdered our Joyce, but he took a big part of our Wendy [Joyce’s sister] that we’ve never gotten back,” Pamela McLain wrote. “He took Joyce’s life, but Philip Scott Fournier also took from Wendy the life she was supposed to have lived. Joyce McLain was described Friday as an accomplished musician and athlete who had a bright future. Fournier, who was 19 when McLain was murdered, continued to maintain his innocence Friday. He is expected to appeal his conviction. The judge also found that the motive for McLain’s death was sexual assault although the evidence showed she was not raped. The prosecution recommended that Murray impose a 55-year sentence. Fournier’s defense team urged the judge to impose a lesser sentence closer to the mandatory minimum of 25 years, but did not recommend a specific number of years. “Our life, as we knew it on Aug. 8, 1980, was turned upside down and we never did get it fully put upright again,” she wrote. “The reason? Because Philip Scott Fournier made a choice to murder Joyce Marie McLain. Joyce’s right to live was taken away by Scott’s hands. 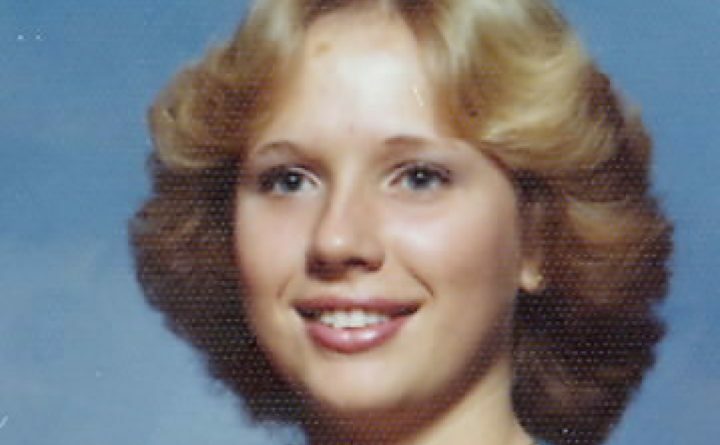 Joyce left home [to go jogging] on August 8, 1980, at 7:10 p.m.
Laura Shea-Merrill of Yarmouth, Joyce McLain’s best friend, told the judge that McLain’s murder and its aftermath had been devastating. She said that her decision not to go jogging with her friend that night has haunted her all her life. “We started the grieving process all over again once the arrest was made [in March 2016] and we were unprepared for that, but we couldn’t truly heal until he was in prison,” Shea-Merrill told reporters after the sentencing. Detectives in 2008 began investigating the cold case homicide as if it were a new case. Fournier was arrested in March 2016 and held without bail since then at the Penobscot County Jail. That time will be applied to his sentence. 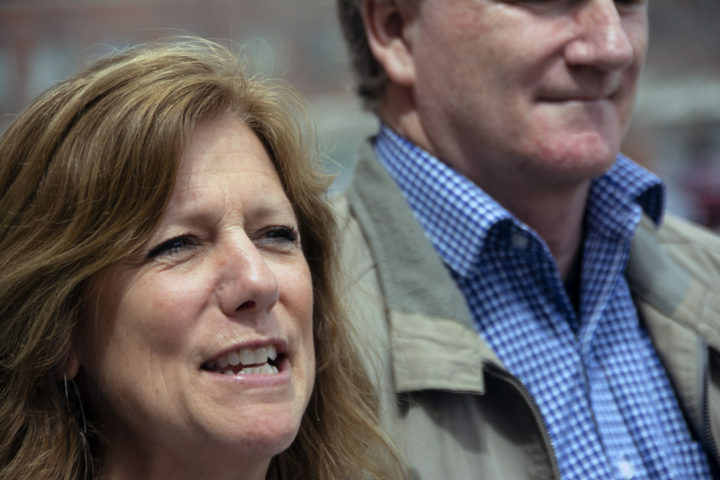 Laura Shea-Merrill expressed satisfaction while standing outside Bangor Judicial Center on Friday, April 27, 2018, with the 45-year sentence given to convicted murderer Phillip Scott Fournier. In February, Murray found Fournier guilty of murder in McLain’s death on Aug. 8, 1980, behind the athletic fields of Schenck High School in East Millinocket following a jury-waived trial. McLain’s partially clothed body was discovered early on the morning of Aug. 10, 1980, with the back of her skull caved in. Heavy rains overnight washed away evidence, according to trial testimony. No fingerprints, fibers or DNA evidence linked Fournier to McLain’s body. In convicting Fournier, Murray found that his 1981 confessions to a minister, his parents and police were confirmed by his alleged 1989 statement, “I killed her,” to a co-worker who asked what he knew about the McLain slaying. Fournier recanted his 1981 confessions but did not take the stand at his trial to rebut Bangor High School janitor John DeRoche’s testimony about the 1989 confession. Fournier told Murray on Friday that a skull fracture he suffered in a car crash about six hours after Joyce McLain was last seen caused him to have nightmares and to confuse them with reality. Fournier stole a fuel truck and crashed it at about 3 a.m. on Aug. 9, 1980, in the neighboring town of Medway, according to testimony. The punishment for murder in Maine is 25 years to life in prison. Attorneys on both sides agreed that a life sentence was not appropriate in Fournier’s case but some family and friends asked that Murray impose the maximum sentence for murder. There are seven conditions under which a judge may send a defendant to prison for life: premeditation; murder accompanied by torture, sexual abuse or other extreme cruelty; murder committed by an inmate in jail or prison; multiple victims; murder of a hostage; a previous murder conviction; or the murder of an on-duty law enforcement officer. None apply in the McLain case. Because of when the murder took place, Fournier can earn one-third off his sentence for good behavior in prison. Current law allows prisoners to earn up to one-quarter off their sentences for good behavior.